The details and rules below build on the information and descriptions provided in the about page. 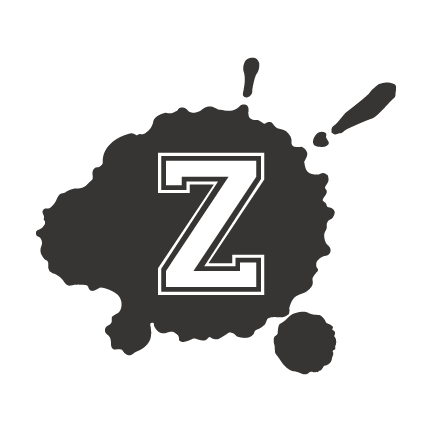 New players are encouraged to visit the about page first before diving into the rules. Assassins Ball: Rise of Sorengard is designed to be a social game where you hunt your targets among the crowd. The intent is that players seek out other players and determine whether they are a valid target and can be assassinated using their assigned missions. Assassins Ball: Rise of Sorengard officially begins on Friday, August 28th at 10:00AM and ends on Monday, August 31st at 8:00PM. While the game is running we request you wear your Player Badge in areas where you are required to display your PAX Pass. You cannot Assassinate or Gather Intel on another player if you are not wearing your Player Badge or wearing it improperly. 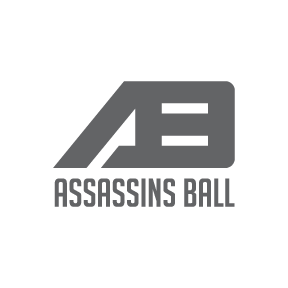 To play in Assassins Ball you will need to be attending PAX East 2015 in Boston, MA, March 6th-March 8th for at least one day. 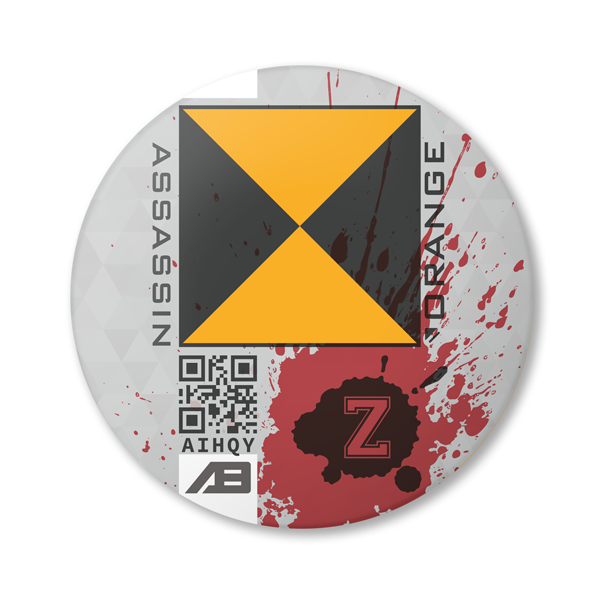 You will also need an Assassins Kit, which contains the physical materials you will need to play, and the ability to access to this website to view missions and confirm them during the game. 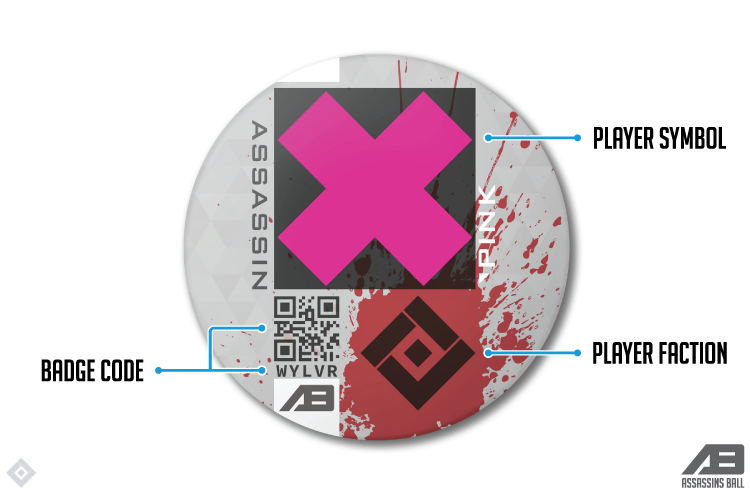 Each assassins kit comes with a 3" button called the Players Badge. 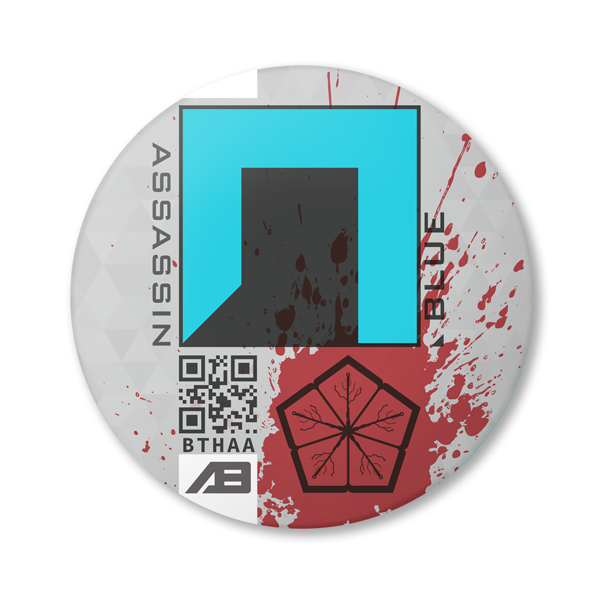 The player badge allows you to identify people playing Assassins Ball and determine whether they are a potential target at a glance. 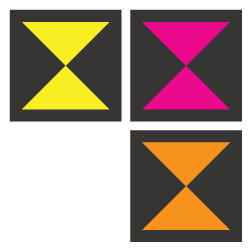 Every player symbol is made up of a shape and a color. 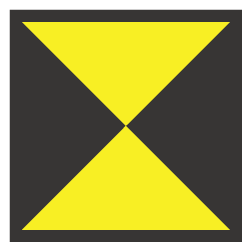 This symbol is the primary element you will look for on other players badges in determining if they are a potential target. 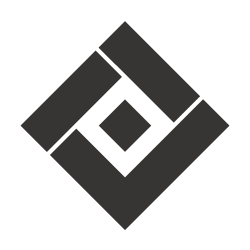 Symbols are not unique among players or factions. The player faction represents the character or group you have allied with. 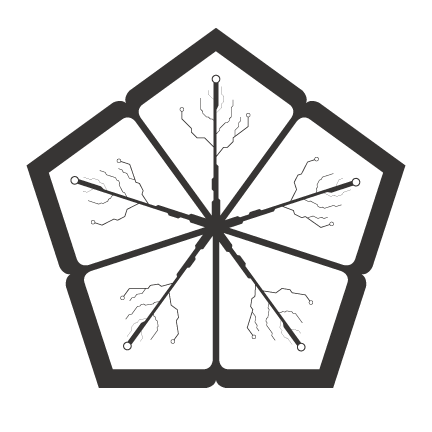 Each faction has their own distinct emblem to make identification easy. Factions are always optional when completing missions, but when successfully matched double the prestige earned for an assassination. The badge code is a unique 5-letter code that is printed your badge; The QR code printed above it resolves to the same value. The badge code is used to synchronize your kit with the game on the website. The player badge comes with both a standard pin-back and a clothing magnet attachment to ensure that it stays on. Your button should be worn on your left arm facing out or on the left side of your chest above your heart. If you have a pacemaker or a device that is disrupted by strong magnetic fields do not use the clothing magnet. 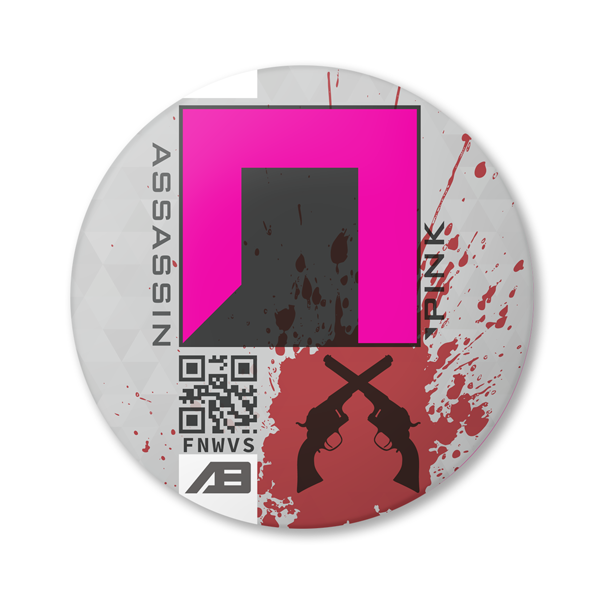 In addition to the player badge each assassin kit comes with a Kill Confirm card that will be used players can confirm they have assassinated their missions target. This card has a 10-length alphanumeric code and a QR code that resolves to the same value. 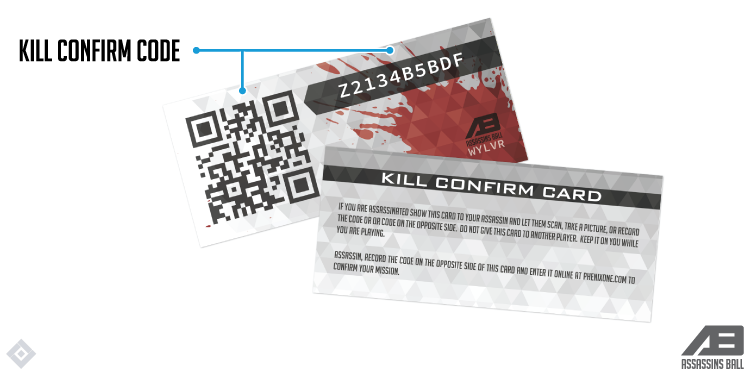 After assassinating a target, you will need to record the Kill Confirm code printed on the targets card. You will need this code to confirm your mission and receive a new one. Before you can begin playing you will need to create an account on the website and register your kit. An account requires a username, email address and password. 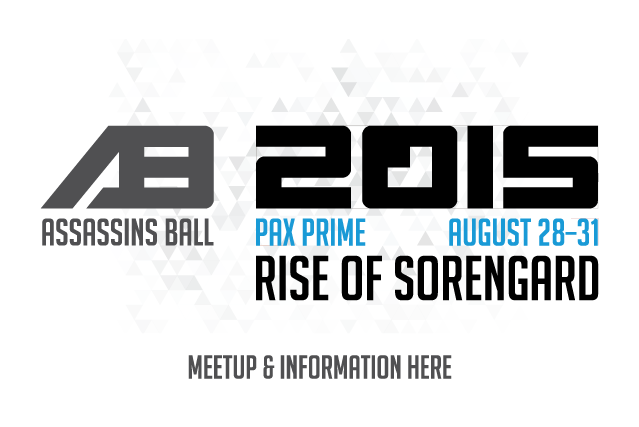 To register your kit, navigate to the Register Kit page for the Assassins Ball at PAX Prime 2015 game and enter the 5-letter badge code on your player badge into the field provided. If you've already registered a kit you will no longer see this page, the My Kit page will replace it and will show you your registered badge. Select a faction above for more information. You've heard of corporations too big to fail? Sorengard is the offspring of three heavy-hitters merging. What do you get when you combine cutting edge software, advanced bio-medical procedures, and military hardware? The Kingsport Raiders are known to be heavily involved with the procurement of occult objects and dealings with dark beings. They use their aquisitions to forward an unknown but assuredly malevolent purpose, acting swiftly and mercilessly against those who stand in their path. 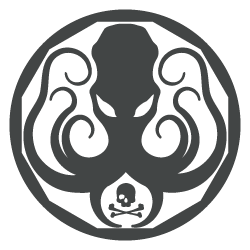 Is it the call of the sea... or the dark whispers of an elder god? Arrr the stars right? The Robot Ninjas are difficult to believe. With little evidence of their actions beyond blurry footage, shaky testimonials and blood drenched scenes of slaughter it's easy to see why their existence has been explained away for more understandable threats. Does your heart burn with vengeance or cold-hard logic? You figured the real world would be different, that your... hmm... special abilities would be better appreciated in the boardroom or classroom than in some dark alley. But no sooner is orientation over when every undead under the sun, and moon, comes out in full force. Is it your first day and the end of the world? We aim to do very bad things. Hmm, that doesn't sound right at all... have to work on that. You need to understand we're not bad people, just more often than not seen in a bad light, and to be fair that's only from the people we're stealing from and they're biased. Out of bullets, out of time, and out of luck? The Sparkly Pwnies were sent to prison for a crime they didn't commit. They promptly escaped from a maximum security stockade into the underground. Today, still wanted by the government, they survive as pwnies of fortune. While you will never receive a mission to assassinate a player from your faction this does not mean you are safe from your fellow faction members; they may still assassinate you and you are free to assassinate them. 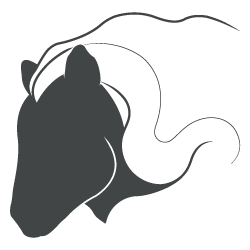 Missions are comprised of a primary target, a range of secondary targets, and an optional faction. Any player whose player symbol matches the primary or secondary target symbols listed on your card is a possible target. Each mission gives you the choice of going by the letter for a perfect stealth kill (Primary Target and/or optional faction) or playing loose with the parameters for the fast assassination (Secondary Target and/or optional faction). How exact you are in completing your missions determines the prestige you receive and how highly your exploits are regarded. Use the sample mission below and the slideshow to its right to the variety of targets each mission allows. 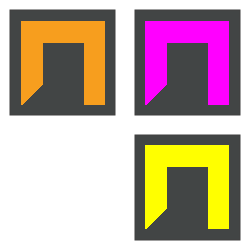 This targets symbol does not match the primary or secondary mission symbols and cannot be used to complete a mission. 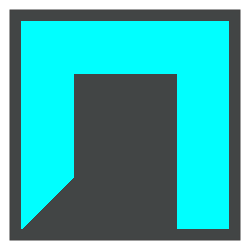 This targets symbol matches a secondary mission symbol. The target faction does not match the optional mission faction so prestige is not doubled. This targets symbol matches the primary mission symbol. The target faction matches the optional mission faction so prestige is doubled. After finding a target, approach the player and inform them you are their assassin. Feel free to do so in your own particular style and idiom. Be mindful of your surroundings and non-disruptive to those around you. Should your target be performing an activity that would be disrupted by you approaching them please wait for the player to finish their activity first. You can only assassinate a player once per game. To complete your mission you will need to record the Kill Confirm code on your targets Kill Confirm Card. 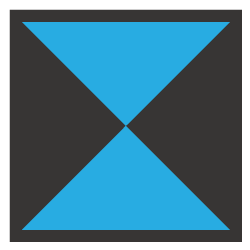 You may take a picture of the card or otherwise record the number on it to use on the Current Mission page of the site. Do not take your targets Kill Confirm Card. If a player approaches you and informs you they are your assassin show them your Kill Confirm Card but do not let them take it. Once they have recorded the code they will hand it back to you. That's it! 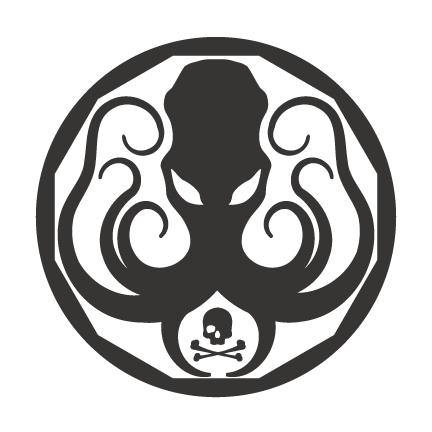 Assassinating a member of your own faction. Assassinating too many members of a specific faction. Rising too high on the leaderboards. 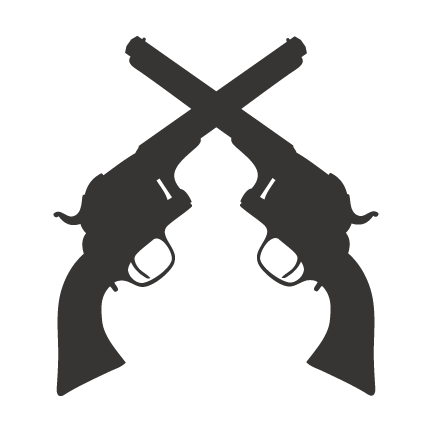 Bounties are comprised of a single target and faction, both of which are required to claim the bounty. Any player whose player symbol matches the primary or secondary target symbols listed on your card is a possible target. A player with a bounty on them doesn't mean any player can target them. In fact, you will only see active bounties for players who match the Primary or Secondary targets of your current mission. 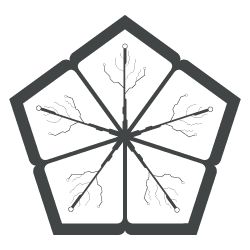 Bounties are redeemed when you assassinate a player that matches the symbol and faction for an active bounty. The game will automatically detect if a bounty exists for a player and redeem the highest prestige bounty available. Each bounty is worth a set amount of prestige that is added to the mission that you redeemed the bounty on. Only one bounty can be redeemed per kill, so make them count. Intel is valuable information being carried by other assassins (even those in your own faction). You'll be able to interact with any player and gather the intel they are carrying, gaining a small amount of prestige each time. You can gather intel from a player a limited amount of times. You cannot gather intel on yourself. You will earn prestige for each successful mission you complete or each piece of intel gathered. The total prestige you earn over a game determines your overall ranking on the games leaderboards. Prestige is the measure of an assassin's skill but it can't give the full account of your deeds, just the magnitude. Challenges in Assassins Ball: Rise of Sorengard fill this role: recognition for completing specific tasks. 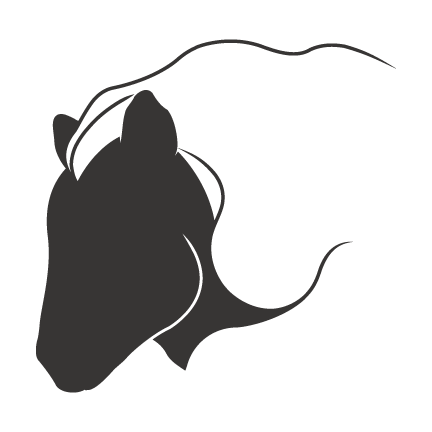 Almost all challenges can be viewed, along with your progress in them, on the website. Some challenges are secret and will will be hidden from view until completed. There is a regular meetup schedule each day of PAX for you to pick up/buy kits, ask questions, or get support in the game. Meetups are a great way to meet other players, find a particularly elusive target and rack up some new intel! All meetups will be in the International Meeting Place on Level 2, in front of the Juicy Cafe. From main entrances head up escalators to Level 2 then around (not up) the the escalators to Level 3.. Make sure to follow us on twitter @PAXAssassins to receive game updates or in case we need to shift locations. Pick up or buy kit(s), ask a question about the game, find a target or grab some intel. Pick up or buy kit(s), ask a question about the game, find a target or grab some intel, and join in on the group photo for the game! Stop by to grab one final kill, gather one last piece of intel, and say goodbye to all the friends and enemies you've made! Murder Spots are quick gatherings of assassins meant to get players interacting. We'll be tweeting our location on @PAXAssassins when possible and giving out small prizes to players who show up! Staying still for a bit? Make your own Murder Spot by tweeting your location to us @PAXAssassins and use the hashtag #ab_murderspot. We'll pass it along to other players! Excited yet? Grab a kit in our online store today!